I will share a story with you all that I have kept fairly private as it still breaks my heart to this day. Even as I write this the tears begin to well up and my heart beats a lil harder at the thought of my beloved Ms2 that I lost years ago to FLD. For those who are not aware FLD is fatty liver disease caused by a very poor diet of seeds and inappropriate human foods, no greens or fresh foods. The store owners wife came up to me when she saw me holding this baby and said “oh we don’t usually take her out because she never wants to go back into her box”…looking down at her box it was easy to see why. I asked for info on her and asked as many questions as I could think of and then the bartering began. I was not leaving without this baby. She was in bad shape and in desperate need of medical attention. They also knew she was not going to sell easily, her feathers were a mess and while I had picked her up very easily she was not as well behaved for most ppl who had come in to see her and I was told she had been there for almost a year on consignment. Well after some bartering I bought her, and a new large cage they had there in the shop. I took her home and immediately to our vet the very next day. That is when we found out how seriously ill she truly was. She was in advanced stages of FLD and her heart was enlarged due to this. Our vet told us exactly what we needed to do and we did everything we possibly could to help this precious baby girl. We knew it was a matter of time but at that point we just wanted her to have the best possible life for whatever time she had left. She immediately became Daddy’s girl and I was not allowed to touch her or my husband when she was around lol. Oh she and I had a wonderful relationship but there was no touching involved. We played games and she allowed me to clean her cage and bring her food of course lol. I was allowed to hand her treats. One day I mistakenly had my elbow resting on the top of her cage while she was out and I was talking with my husband and she very quickly came over and nabbed the fleshy part of my forearm. She left a good mark but I had to laugh because I knew why she had done it and made sure not to make that mistake again. Each night we played a game through the bars of her cage after she had gone to bed. She would go in by herself and then we played for a few minutes and I would give her a bedtime treat. She became the center of our life and we adored her. She had 8 months with us before the lord called her home. The night she passed, earlier she lifted up her foot and asked ME to pick her up. My eyes were filled with tears and she stepped up and cuddled into me once again. I was so thrilled to be able to touch and hold her again. That night I actually carried her to her cage and put her inside. I swear I saw tears in her eyes too. I know that isn’t possible but I saw it. It was just hours later that she had a massive heart attack and died. We were right there with her and holding her as life slipped from her. I believe she knew it was her time and that is why she asked to step up for me earlier, she wanted to take a moment and thank me for sharing my life with her. I cradled that baby for hours before I could let her go. And I made a promise to her that I would do everything possible to help all the other birds out there in captivity. So while I had birds for most of my life, this lil tiny girl brought me awareness of the plight of parrots in captivity. I began researching and educating myself on parrots. At that point I had no idea that parrots rescues even were around. I had no idea that thousands upon thousands were in need of homes and tossed aside. I had no idea how horrible life was for some of these babies and especially the ones in breeding mills. So for those of you who have asked why I am so passionate about adopting and not purchasing….hopefully this will help to answer your questions. It is not a whim or a passing phase for me, it is because of looking into the eyes of one special little angel and my world-changing forever. Many have heard me state that “I made a promise to these Angels and intend to keep it”….She is the reason…. I also want to include that when I returned to that particular pet store, they had many birds for sale. I tried to educate the owner on what I had learned but to no avail. 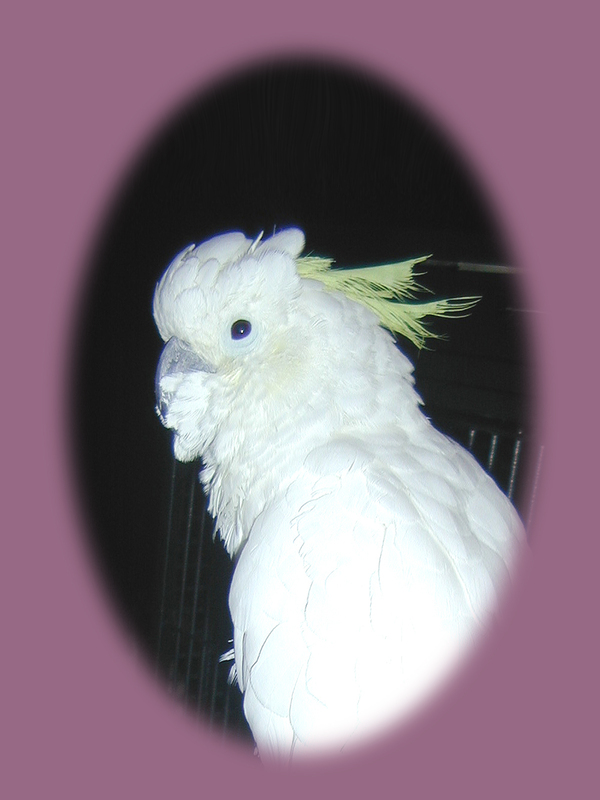 I have since gone to many local pet stores and tried to get the owners to stop selling birds or any live animals. I have had some success and some not so successful. However I intend to keep my promise to that precious little girl who I hold in my heart every single day. Couldn’t stop crying as I held my little girl. Thank you for sharing your story.